Many, today, are following after "another Jesus": A "Jesus, whose name was crudely painted on barns and rocks in the 30's. The same "Jesus" who was adored by the perpetrators of the Inquisition. A "Jesus, with long hair, flowing robes, halo, sick expression, thin aquiline nose, petulant lips. One who supposedly died of a "broken heart." 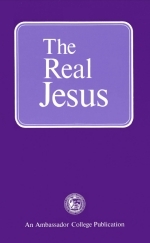 Read, in this booklet, of the TRUE Jesus Christ: How he paid taxes; slept in houses, at least one of which was His own; DID NOT come "head to head" with the "establishment"; and did not have long hair. Read of the TRUE CHRIST for a change — and turn from fables to the REAL JESUS. WHO IS Jesus Christ? What is He like? What does He look like? Do you personally KNOW Jesus Christ? Look what the professing "Christian" world does NOT know about Christ! Most denominations and sects do NOT know the TIME of Christ's birth. Millions assume it was December 25th. Bible scholars admit it was nowhere near this date — but probably in the autumn. Millions suppose it must have been at the beginning of the year 1 A.D. — not realizing it was 4 B.C. Millions disagree on the METHOD of His birth. Few know WHAT HE WAS. Was He GOD CHANGED INTO a human fetus? Was Christ the God of the Old Testament? Was Christ just a "good man" or a "prophet"? Was Jesus only HUMAN, after all? Or was He GOD? Or was He BOTH? People are confused. Most don't know WHY He came. Millions assume He came to save the world THEN — and assume He has been frantically trying to get it saved ever since! Yet HE said HE DID NOT! Millions don't know Christ came with a MESSAGE — NOT for the world, but for His own disciples. They don't know what that message was, to WHOM He brought it, or for what purpose. No one seems able to agree on WHY He died (He said NO ONE is saved by His death — but by His life! Romans 5:10), nor on HOW He died. Many assume He died of a broken heart. Millions aren't sure He DID die — but believe possibly only His BODY died, while HE went to preach to "spirits" in HELL. But how can this square with the promise millions assume He made to the thief on the cross about being IN PARADISE? The thief wasn't WITH Him when He appeared to His disciples over three days later. No one seems able to agree on HOW LONG He (if it were He!) Was in the tomb — or even WHICH tomb! Most of professing Christianity REJECTS His own plain statements about the ONLY SIGN He would leave as to His true Messiahship — that of three full days and three full nights in the tomb (Matt. 12:39, 40) — and suppose a Friday sunset to "Easter" (spelled Ishtar in ancient Babylon) Sunday morning is what He meant. Try to fit three days and three nights into that period of time. Millions DENY He was resurrected — claim His body was stolen, or that He wasn't really dead, that He only feigned death, and then died in the tomb, only to have His disciples secretly bury Him elsewhere. WHETHER He was resurrected is always the subject of MUCH CONTROVERSY between "Christian" scholars! Let's suppose you're talking to a person about a mutual friend. You're discussing what a "fine fellow" he is. You don't know what his name means, don't know the circumstances surrounding his birth, don't know anything about his life; don't know what he believed or stood for; don't know what he looks like; don't know his nature, personality or character; don't know his family; don't know where he is; don't know where he's been; don't know where he's going. That's quite a bit NOT to know about someone and still call him "friend," isn't it? Does this professing "Christian" world REALLY KNOW CHRIST? The REAL Christ of the BIBLE? It has substituted a weak, sickly, effeminate, confused FAILURE for the dynamic, thoroughly masculine, POWERFUL Christ of the Bible. And what about You? Are some of these points a little confusing to You? Do YOU know Christ? I don't mean in some sticky, syrupy, "sanctimonious," "religious," or "sentimental" way you merely recognize the phonetic sound of His name — but do you know ALL ABOUT Him? It would shock many to know that the REAL Christ came not to bring peace but a sword (Matt. 10:34-37); that He drank wine; that He lived a life of fantastic interest — one of LOVE, one of ruggedness and challenge! What was Jesus Christ really like? I mean the REAL JESUS! The remainder of this booklet may shock you. Its contents are straight out of your own Bible. Is THERE anything wrong with the REAL Christ? What if you could prove, and prove that you've proved, that the REAL Jesus did not have long hair, did not come "head to head" with the "establishment" of His time, did pay taxes, did submit to the laws of the land, did not try to "convert" people THEN, and did teach obedience and respect toward the powers that be? What if you could prove from the Bible, these shock¬ing statements? If you could see it proved, would you then TURN TO THE REAL CHRIST? Would you then realize that you have always thought of a different Christ than the One revealed in the Scriptures, that you have blindly swallowed a traditional and historical hoax, and repent? Would you? Remember, your Bible warns against accepting "another Jesus" and "another gospel" (II Cor. 11:4). Read the first chapter of Galatians and see the curse Paul calls down on those who have "another gospel." If your Jesus and your gospel differ from the clear simple message of the Bible — you are in trouble! Surely, if finding Jesus is your deepest and most heartfelt goal-your earnest desire, then you're not going to reject the true Christ when you do finally "find Him ," are you? Editor's Note: Write for our free reprint articles "Did Jesus Have Long Hair?" and "Is It Wrong to Have Pictures of Christ?" for the historical proof that Jesus did not wear His hair long. The Biblical proof follows. Don't deceive yourself into believing for one moment Christ had taken any "Nazaritic vow" of sorts. He superseded the Nazarite, and the Levite. He became the High Priest after the order of Melchizedek (Hebrews, 7th chapter), and did not fulfill any of the scriptural obligations laid upon a "Nazarite" (Num. 6:3, 6). For example, He on occasion touched a dead bod y (Matt. 9:25). And shocking as it may be to many who believe in total abstinence from all alcoholic beverages, Jesus drank wine from time to time (Matt. 11:19); and His first miracle involved creating fine wine, more than a hundred gallons of it, from water. He also drank wine at the first New Testament Passover service (Matt. 26:27-29). For a full explanation of this subject, read our free article "Is Drinking a Sin?" It shows how scriptures like Amos 9:14, Ecclesiastes 10:19 and I Timothy 5:23 prove it is right in God's sight to drink alcoholic beverages in true moderation. Furthermore, those under a Nazarite vow let their hair grow long as a token of humiliation. It was a sign of shame. Notice, too, that as soon as the time period of the Nazarite vow was over, the one who undertook the vow was to shave his head (Num. 6:18). Frankly, Jesus Christ — as a human being — was of quite ordinary appearance. It was His message, not His looks, that was striking. We are told, "He hath no form nor comeliness; and when we shall see him, there is no beauty that we should desire him" (Isa. 53:2). Jesus looked like any other normal Jew of His day. On a number of occasions He was able to pass through crowds because He looked just like anyone else (John 8:59; 10:39). Judas had to use a special sign, a kiss, to point out to Jesus' enemies which one He was. Judas would not have had to do this if Jesus had long hair. The Jesus Christ of the Bible was a medium-built, dynamic and rugged individual. Jesus, remember, was a carpenter, a builder in the hard and stony hill country of Galilee. He had worked with heavy stones and timbers all His life. Continually, people cite the case of Jesus chasing the cattle and money changers out of the Temple, believing it to be an example of lawbreaking on Christ's part. Apparently, they have never read the scriptural account; or if they did, they read it only cursorily, and without real understanding. Read it, in your own Bible. You'll find the account in Matthew 21:12-16; Mark 11:15-18; Luke 19:45-47, and John 2:14-17. Actually, Jesus TWICE drove out the cattle, and over¬ turned the various money-changing booths and ordered their owners and proprietors out of the Temple. John's Gospel illustrates the first occasion, during an earlier Passover season, and the other three speak of the later occasion, at Christ's final trip to Jerusalem. Christ was in authority here, not a casual visitor. Not once did the money changers, nor the owners of the cattle, nor the Jewish religious leaders, say one word about anything "unlawful." If He broke the law, why not arrest Him? But no law was broken; it was being UPHELD. Christ CITED the law, when He quoted Isaiah 56:7. He, then, was a representative, both of the property (the Temple), and the law. Remember, too, that even when false witnesses were being bribed to bring false charges against Him during His trial, not once did anyone bring up the issue of Christ chasing the cattle and money changers out of the Temple — even though He did so TWICE, about two years apart. Some have assumed plucking corn (wheat) in a field by Christ's disciples and His healing on the Sabbath were illegal acts. Not so! There were laws requiring the landowner to leave some produce on the stalk or the vine for the hungry traveller (Lev. 19:9-10; 23:22), laws which were stringently enforced, even by the Pharisees themselves. What about healing? Some have contended Jesus' healing of a deformity on the Sabbath was a breaking of some law. But notice the example, found in Mark 3:1-6. Jesus was in a local synagogue, confronted by a man with a horribly deformed hand. The Pharisees "watched him, whether he would heal him on the Sabbath day, that they might accuse him." Notice, they were not enforcing or interpreting any duly constituted law, but were "watching" suspiciously to see whether they could accuse Him of having violated :my of their humanly devised traditions. Before the healing, Jesus asked them, "Is it LAWFUL to do good on the sabbath days, or to do evil? To save life, or to kill?" Jesus knew what He did was lawful. He knew that their own laws, even including their religious traditions, allowed an act of mercy on the Sabbath day (pulling a helpless animal out of a ditch was lawful). Nothing unlawful about this healing, was there? They, too, knew it was lawful, and that's precisely why they didn't answer but went out silently. Some have claimed Jesus "insulted" the High Priest on the occasion of Jesus' questioning prior to His murder. But why not read the account for yourself? You'll find it in John 18:21-23. Jesus had said, "Why askest thou me? Ask them which heard me, what I have said unto them: behold, they know what I said. And when he had thus spoken, one of the officers which stood by struck Jesus with the palm of his hand, saying, Answerest thou the high priest so?" Jesus then said, "If I have spoken evil, bear witness of the evil: but if well, why smitest thou me?" Not one word from the High Priest. He, himself, did not answer Jesus' truthful statement. The High Priest's question, itself, was hypocritical. Jesus gave a straightforward, truthful answer to a misleading question. A pompous officer then struck Jesus. This WAS an insult. This most certainly WAS illegal. But what was Christ's reaction upon being struck, illegally, by an officer? Just calm, studious, patient truth. He said, "If I have told the truth, then why do you strike me?" No, Jesus DID NOT break the laws. He urged His own disciples to obey them, saying, "The scribes and the Pharisees sit in Moses' seat: All therefore whatsoever they bid you observe, that observe and do; but do NOT ye after their works: for they say, and do not" (Matt. 23:2-3). Plenty of hypocrisy around, even in Jesus' day. The "establishment" of His time, remember, constituted a captive, mostly irreligious populace, ruled by a puppet king, and a Roman governor. The religious leaders (Pharisees, Sadducees, Zealots, Essenes, etc.) were various MINORITY groups, and, even though the masses generally feared the Pharisees (because they were in charge of the synagogues and therefore leaders in the community) and the Sanhedrin (because of its legislative and punitive .powers), the MAJORITY of the people were not really "religious" in a devout sense. Thousands of them were shocked by what Jesus said and did. Crowds FOLLOWED AFTER HIM; He DID NOT seek them out! Christ Subject to Civil Authorities? Christ broke no laws and He never urged anyone else to do so. Had there been a conflict between the laws of the land and the higher laws of God, which were believed and OBEYED by Jesus, here is the Bible teaching on what Christ would have done. "We ought to obey God rather than men," said the Apostle Peter, answering religious persecutors (Acts 5:29). "Let every soul be subject unto the higher powers. For there is no power but of God: the powers that be are ordained of God," said the Apostle Paul (Romans 13:1-7), urging Christians in Rome to OBEY the civil government insofar as it did not conflict with GOD's laws. "Whosoever therefore resists the power [civil authority], resists the ordinance of God: and they that resist shall receive to themselves damnation. For rulers are not a terror to good works, but to the evil." How does this square with the nebulous personal ideas and interpretations of various "spiritual" leaders who urge upon their followers resistance toward society? Paul, remember, was talking to Christians, inspired by the very Jesus Christ who lived IN Paul (Gal. 2:20), and was urging Christians who lived right in the capital city of the greatest totalitarian, tyrannical police state to ever exist that they should remain OBEDIENT. Read on in Romans 13: "Wilt thou then not be afraid of the power? Do that which is good and thou shalt have praise of the same: For he is the minister of God to thee for good. But if thou do that which is evil, be afraid; for he beareth not the sword in vain: for he is the minister of God, a revenger to execute wrath upon him that doeth evil. Wherefore ye must needs be subject, not only for wrath, but also for conscience sake. For this cause pay ye tribute [taxes] also: for they are God's ministers, attending continually upon this very thing. Render therefore to all their dues: tribute [taxes] to whom tribute is due; custom [duty, or import taxes-Greek telos meaning an "impost" or "levy"] to whom custom; fear to whom fear; honour to whom honour" (verses 3-7). Not only did Christ and all the New Testament leaders urge obedience to civil authority, but they urged Christians to pray for guidance for their civil leaders. Notice I Timothy 2:1-2: "I exhort therefore, that, first of all, supplications, prayers, intercessions, and giving of thanks, be made for all men; for kings, and for all that are in authority; that we may lead a quiet and peaceable life in all godliness and honesty"! No, the Christ of the Bible was not a lawbreaker -but the greatest example of OBEDIENCE TO LAW in all history. Are you willing to accept the true Christ — the lawabiding Christ of the Bible? Jesus Christ was followed, sought after, looked for, eagerly listened to, by the general public — the "silent majority" of His day. Now, notice His nationwide following. "And he came down with them, and stood in the plain, and the company of his disciples, and a great multitude of people out of all Judaea and Jerusalem, and from the sea coast of Tyre and Sidon, which came to hear him, and to be healed of their diseases" (Luke 6:17). Also read the account where Jesus was welcomed with great ceremony by a large group of Jerusalem's citizens. You read of it in Matthew 21:1-11. The Pharisees were afraid — deeply worried — about Christ's nationwide support. Notice it in John 12:19 — "The Pharisees therefore said among themselves, Perceive ye how ye prevail nothing? behold, the world is gone after him." That is why He was tried and put to death. Notice the example of Christ's personal feeling toward soldiers, even "enemy" soldiers, of an occupying army. Read the account for yourself in Luke 7:1-10. Here Jesus gladly healed the servant of a Roman centurion in Capernaum. Further, Jesus' teaching, even in the Sermon on the Mount, was humble COMPLIANCE with harsh mistreatment from the military. The example of "compelling" a person to "go a mile" was directly related to the practice of Roman mail carriers requiring persons along their route to carry a burden a certain distance (Matt. 5:41). Christ said not to resist this harsh and illegal practice, but to humbly acquiesce. Rather, He was busily performing that great JOB He had been given to do: "I must work the works of him that sent me, while it is day: the night cometh, when no man can work" (John 9:4). He was calling and training His disciples to carry on after His death and resurrection (Matt. 28:19, 20; 4:18-22; 10:1-16; Luke 10:1-11; Mark 16:15), and was continually setting an EXAMPLE of perfect mannerisms, culture, language, habits, speech, and outgoing love toward all men (I Peter 2:21-24; Luke 4:16-21) and was keeping out of "politics" and heated local issues. Notice Jesus' answer to Pilate's questioning: "My kingdom is not of this world ..." (John 18:36). Christ plainly urged His disciples to come out of this world (John 17:6,8, 14, 16; I John 2:15; Rev. 18:4; II Cor. 6:14, 17; I Cor. 5:11) and NOT to become "political activists" or to attempt to influence in politics. Jesus was widely accepted by the general populace. It was the minority religious leaders who persecuted Him. Even the Roman government remained largely aloof, including Pilate's infamous "washing of the hands" during Jesus' trial. The false claim that Jesus was an "activist" type of vagabond who sponsored "street rallies" is totally erroneous. God prophesied of Him, "He shall not cry, nor lift up, nor cause his voice to be heard in the street" (Isa. 42:2). Time and time again, when Jesus' remarkable teachings resulted in the gradual gathering of a crowd (even about a house which very definitely appears to have been His own), Jesus attempted to escape such large crowds by either taking a boat to cross the Sea of Galilee, by going into a different part of the country, or, even as in the case of the "Sermon on the Mount," by climbing a high mountain nearby, where the majority of the crowd could not follow. It comes as a profound shock to most to realize that Jesus did not attempt to "convert" people then — and He explained this principle to His disciples. Read Matthew 13:10-15 — "And the disciples came, and said unto him, Why speakest thou unto them in parables? He answered and said unto them, Because it is given unto you to know the mysteries of the kingdom of heaven, but to them it is not given. For whosoever hath, to him shall be given, and he shall have more abundance: but whosoever hath not, from him shall be taken away even that he hath. Therefore speak I to them in parables: because they seeing see not; and hearing they hear not, neither do they understand. And in them is fulfilled the prophecy of Esaias [Isaiah], which saith, By hearing ye shall hear, and shall not understand; and seeing ye shall see, and shall not perceive: For this people's heart is waxed gross, and their ears are dull of hearing, and their eyes they have closed; lest at any time they should see with their eyes, and hear with their ears, and should understand with their heart, and should be converted, and I should heal them." You see, Christ in His day did not try to disturb the spiritual blindness that was over their minds. Here is Mark's account: "Unto you it is given to know the mystery of the kingdom of God: but unto them [the vast majority] that are without,. all these things are done in parables: that seeing they may see, and not perceive; and hearing they may hear, and not understand" (Mark 4:11-12). Parables were spoken to hide the truth, not to make the meaning clearer. Some claim that Jesus did not associate with the "respectables." They believe He hobnobbed and ate with the poor and wretched class only, avoiding the upper crust — the scribes, the Pharisees, and elders. The Bible plainly speaks of Jesus entering into the homes of some of the greatest and most respected Pharisaic leaders. He also was personally acquainted with tax collectors and many rich men of His day. Notice Luke 7:36-39 — "And one of the Pharisees desired him that he would eat with him. And he [Jesus] went into the Pharisee's house, and sat down to meat [to eat a meal]." Tax collectors (although understandably not very popular with the Pharisees or the common people because they collected taxes for the Romans) were part of the wealthy intelligentsia or upper class of that day. Read Luke 5:27-29: "And after these things he [Jesus] went forth, and saw a publican, named Levi, sitting at the receipt of custom: and he said unto him, follow me ... And Levi made him a great feast in his own house: and there was a great company of publicans [tax collectors] and of others that sat down with them." Notice the narrative of Jesus' visit in Jericho. "And Jesus entered and passed through Jericho. And, behold, there was a man named Zacchaeus, which was the chief among the publicans, and he was rich. And he sought to see Jesus who he was...And when Jesus came to the place ... and said unto him, Zacchaeus…today I must abide at thy house ... And he [Zacchaeus] ... received him joyfully" (Luke 19:1-6). Jesus was well acquainted with Joseph of Arimathaea, who obtained Jesus' dead body from Pilate and buried Him. Look at what the Bible tells us of this man. "When the even was come, there came a rich man of Arimathaea, named Joseph, who also himself was Jesus' disciple" (Matt. 27:57). Now notice Luke's account, "And, behold, there was a man named Joseph, a counsellor [of the great Sanhedrin or Jewish legislative body-see Clarke's Commentary by Adam Clarke, Vol. V, p. 279]; and he was a good man, and a just: (the same had not consented to the counsel and deed of them;) he was of Arimathaea, a city of the Jews: who also himself waited for the kingdom of God" (Luke 23:50-51). Also read for yourself of Jesus' conversation and association with Nicodemus, a Pharisee and leader of the Jews (John 3:1-12; 7:50-53; 19:39). The wedding feast at Cana in Galilee (John 2:1-11) was a case where Jesus was "hobnobbing" with the "upper crust." Such a great feast was obviously given by wealthy people. The occasion of the healing of a centurion's servant was another case. A centurion was a leader over one hundred men, which in all likelihood meant the head of the garrison at Capernaum and the leading Roman officer for the area. This is not to say that Jesus showed these people any more SPECIAL attention than He did the masses and the "poor and wretched class." Jesus Christ "was all things to all men," and was never a "respecter of persons." EVEN THOUGH it is very obvious Christ was not married, He was, nevertheless, a member of a fairly large family. After the enunciation of Jesus' conception and virgin birth, Joseph, already the husband of Mary, bound by the "espousal" though not yet having consummated the marriage, reacted in a manner which is incomprehensible for a very young man. Turn to Matthew 1 and verse 19, "Then Joseph her husband, being a just man, and not willing to make her a publick example, was minded to put her away privily." To a younger man, such an enormous announcement would have been met with a great deal of righteous indignation, petulance, jealousy, and weird imaginings. Almighty God chose, for the prospective legal father and the mother of His own Son, Jesus Christ, the very best conceivable parental examples. Not only was Joseph of the direct line (explained in the preceding verses of Matthew 1) of David and from David back to Abraham, and thence to Adam, but he was also a righteous man, and a prosperous one. Both Joseph and Mary were obedient to the laws of God, and when you understand the laws of God as magnified in Old and New Testaments alike, including even the laws of success, of physical cleanliness, and of husband­and-wife relationships, you have a much clearer picture of the circumstances under which Christ was reared as a young child. In Luke 2:51 you read of how Jesus, after the incident of being found teaching in the Temple at age 12, returned to the home of His parents, and "was subject unto them." Christ's antagonists said, "Isn't this the carpenter's son?" And this is mentioned more than once. Joseph, then, was a "carpenter." In our specialized societies, carpenters are thought of as those who work with sawn and hewn lumber, and primarily work only at pounding nails into boards. Ask a modern carpenter if this is "all he does," and he will very likely give you a lengthy lecture about the many skills required to become a good carpenter. However, during the day of Jesus Christ, "carpentry" included much more than just the fabrication of wooden dwellings. Most of the homes were a combination of stone, mud and clay, and hewn beams and "lumber." The city where Jesus spent much of His early ministry around the Galilean area was Capernaum. I have been to Capernaum several times, and have seen the remnants of the porches, the arches, the mosaics, and the walls of the buildings which were there during the time of Christ. Capernaum, at that time, was a beaming, modern, beautifully sculptured Grecian-ty pe city. It was filled with beautiful multi-leveled homes which had large central gardens, mosaic walks, fountains and even, believe it or not, indoor bathrooms and steam baths! The homes of the wealthier class during that time were marvels of architecture, and a far cry from the stone and adobe hovels imagined by many as being the general domicile of the time. A "carpenter" would have to know a certain amount of mathematics, engineering principles (working with block and tackle, levers, and knowing how to construct arches and cantilever overhanging balconies, etc.) and especially would have to be skillful in finishing work, such as interior surfaces, mosaic hallways and walkways, and would even have to know a certain amount about plumbing. Believe it or not, all during that day and in the first two or three centuries thereafter, home plumbing included indoor water, which was delivered via a system of pipes and could be cut off by values just as in a modern home today. This may seem astounding to many people who have not familiarized themselves with the degree to which architecture and the science of home building had advanced during Jesus' day. It was not uncommon, especially around areas where subterranean "hot springs" were abundant, for large central buildings to be constructed with Roman "baths," which usually featured several levels of open, running water around niches in the walls and underneath stones in the floors, through which would be ducted hot, boiling spring water. Wealthy Romans could then sit in this common "steam room" and enjoy a steam bath. It is essential to get somewhat of a picture of the cities of Christ's day (remember — He spoke of Capernaum as being "exalted unto heaven") in order to really comprehend the way of life lived by the common people, and by Christ Himself and His own family. Generally, a boy of about twelve years of age could be thought of as entering into "adult society." This is obvious, too, when you consider the account of Jesus with the doctors and the lawyers of the Temple at age twelve. However, Christ's ministry did not begin until He was "about thirty." That means that at least from age twelve or a little later on up to age thirty, Jesus remained with Joseph (or if Joseph died sometime earlier, Jesus remained with the family) as a "carpenter," laboring and working all over the hill country of Galilee — no doubt principally in the cities of Nazareth and Capernaum. Remember, too, that Joseph and Mary went on to have a large family. His brothers were named James, Joses, Simon and Judas (Matt. 13:55). There were "sisters" (verse 56) implying more than one — though how many is not stated. So, by the very least reckoning, there were five sons, and two daughters. Remember, this is a conservative number, since there could have been more than two girls. Mary then, was eventually the mother of at least seven children. Editor's Note: For further proof of this, write for our special printed letter "Did Jesus Have Brothers and Sisters?" And it requires a man of some substance — a family obeying the laws and the precepts of God, including the laws of success, to properly provide for a family of this size. Joseph was obviously a prosperous businessman — more like a "general contractor" than just a hammer¬ wielding one-man carpenter. It would have been contrary to God's laws to have brought into the world so many youngsters if Joseph had not been amply able to provide for them. Jesus, then, while He was not married, did grow up as a young man with brothers and sisters, and was very definitely a "family man" in the sense that He, as the elder brother, became the leader of the family, and directly responsible for it. Not one more word is heard of Joseph after the time of the mentioning of the word "parents" in Luke the second chapter. From that time on, whenever Mary and the other children are mentioned, they are alone. Obviously, though the Bible does not record the event, Joseph had died some time after Christ's twelfth birthday and prior to His thirtieth. Joseph is never mentioned, and is nowhere on the scene, during the entirety of Christ's ministry, or even at His death. Yet, Mary and the brothers and sisters are mentioned on several occasions. Many have reasoned that, because Jesus spoke to His disciples of all His "brothers and sisters" meaning any other human being, that He did NOT have REAL brothers and sisters. Not so! The account of Matthew 13, verses 55 and 56, is very clear in this regard. The brothers are specifically NAMED in that account, and Jesus had no disciple called Joses, and certainly He had no female apostles! John 2:12 is very plain. "After this he went down to Capernaum, he, and his mother, and his BRETHREN, AND his disciples: and they continued there not many days." Here, the Biblical account written by John, that "disciple whom Jesus loved," very clearly shows that His disciples and His "brethren" were two different groups of people. Some have misunderstood Christ's lesson given upon the event of the arrival of His brothers and sisters concerning the "brotherhood" of all mankind, and assumed, without checking these scriptures carefully, that Jesus had no earthly kin. However, notice the account in Mark, the 6th chapter. As Jesus was teaching in the synagogue, some of His persecutors began to say, "Is not this the carpenter, the son of Mary, the brother of James, and Joses, and of Juda, and Simon? And are not his sisters here with us? And they were offended at him. But Jesus said unto them, A prophet is not without honor, but in his own country, and among his own kin, and in his own house." Notice. Jesus plainly said, "Among his OWN KIN." He plainly admitted, then, that He, the prophet who was being dishonored, was, at that time, in His own country, and AMONG HIS OWN KIN. He also plainly stated that He was IN His OWN HOUSE! Did Jesus Have a House? Time and time again, in the account of Christ's early ministry around the Galilean area, it shows He was in a house. From time to time it was the house of Peter, or the house of one of the other disciples, or Christ's own. Notice a few of the more outstanding examples. "And when Jesus was come into Peter's house, he saw his wife's mother laid, and sick of a fever" (Matt. 8:14). Here, you see Peter had a house in Capernaum, and also you can understand by the scripture that Peter had a wife. Again, though it is so plain in the scriptures, MILLIONS do not know or understand that Peter either owned a home, or that he was a married man. (See also I Corinthians 9:5). Yet the Bible is very clear on these points. There are many such examples in the Scriptures. "While he yet talked to the people, behold, his mother and his .brethren stood WITHOUT" (Matt. 12:46). Notice that Jesus was indoors on this occasion, and because of the large group inside, His own family could not enter, but had to wait "without." Notice! "The same day went Jesus out of the house, and sat by the seaside" (Matt. 13:1). Again, Christ was in a home, where He no doubt had opportunity to sleep when He was tired, and to bathe when He needed it — which was fairly often! And to have opportunity for privacy just as ANY human being would require. Notice! "Then Jesus sent the multitude away, and went into the house: and his disciples came unto him, saying, Declare unto us the parable of the tares of the field" (Matt. 13:36). Again, Jesus sent the crowds away and entered into a house. Very likely, this was His OWN since it was in Capernaum, and Jesus continually went in and out of Capernaum, remaining in the area of Capernaum for much of His Galilean ministry. Later, Jesus went up to Nazareth. The Bible says, "And when he was come into his own country, he taught them in their synagogue, insomuch that they were astonished ..." (Matt. 13:53-54). Obviously, Jesus said He was in His own country, and IN His OWN HOUSE, when He was being disrespectfully spoken of. The earlier scripture on the same subject proves that "house" is not synonymous with "kin." It is true that Jesus, on many occasions, "went up into a mountain apart to pray" (Matt. 14:23), or was in a "desert place" (Matt. 14:15), and that He slept out-of­doors on occasions. But to assume Jesus lived the life of a dirty, grubby vagabond who never had opportunity to wash or to bathe, and that He lived on "hand-outs" or what He could glean from the fields as He traveled, is utterly ridiculous and without basis in scriptural fact. During the account of the first New Testament Passover (commonly called the "Lord's Supper"), Jesus washed His disciples' feet, setting a deeply spiritual example for all Christians (read John 13:1-17). When it was Peter's turn, he protested first, and then went to the other extreme of wanting his whole body to be washed. In verse 10, Jesus said, "HE THAT IS WASHED [BATHED] NEEDETH NOT SAVE TO WASH HIS FEET, BUT IS CLEAN EVERY WHIT. ..." Here it is obvious that Jesus and His disciples had bathed prior to the meal, and only their feet were dirty, since they wore sandals in that day. Jesus not only stayed in a home much of the time, but He was also a taxpayer! In Matthew 22:15-22 Christ plainly said that it was lawful to pay tribute [taxes] and to "render unto Caesar the things that are Caesar's . . . ." And why would anyone pay taxes? For one of two reasons. He either had an income, or else he owned property, or both. Notice the example, "And when they were come to Capernaum, they that received tribute money [taxes] came to Peter, and said, Doth not your master pay tribute? He saith, Yes" (Matt. 17:2 i-25). The plain statement is Jesus DID pay taxes. But notice the rest of the verse. Again, Jesus entered into a house on this occasion. Even when Jesus traveled, He usually made arrange¬ments to stay in another home, at an inn, or to provide for some suitable lodgings. Notice this example in Luke 9:51-56: "And it came to pass, when the time was come that he should be received up, he stedfastly set his face to go to Jerusalem, and sent messengers before his face: and they went, and entered into a village of the Samaritans, to make ready for him [to arrange for a place to stay]. And they [the residents of the village] did not receive him, because his face was as though he would go to Jerusalem." The Samaritans in this village did not allow Him to stay there because he was going to Jerusalem, while the Samaritans maintained a rival "holy site" on Mount Gerizim. The location of the Temple was a bone of contention between the Jews and the Samaritans (John 4:20). "And when his disciples James and John saw this, they said, Lord, wilt thou that we command fire to come down from heaven, and consume them, even as Elias did? But he turned and rebuked them, and said, Ye know not what manner of spirit ye are of. For the Son of man is not come to destroy men's lives, but to save them. And they went to another village." Then notice another example, "And he left them, and went out of the city unto Bethany; and he lodged there" (Matt. 21:17). Jesus had gone out of Jerusalem to the town of Bethany, which is very close by. He "lodged there" rather than sleeping out-of-doors on this occasion. "And again he entered into Capemaum after some days; and it was noised that he was in the house" (Mark 2:1). The expression "in the house" can be rendered "at home." See the original Greek and also The New English Bible and The New Testament of Our Lord and Saviour Jesus Christ — John Broadus, et al. Jesus freely entered into the homes of the leaders of the society, usually at their own request. Still, many people who totally misunderstand the truth of Jesus Christ of Nazareth, assume He was only a vagabond, someone who associated with "street people," and who continually scorned or spurned any contact with the "uppercrust" of society. But read the account in Mark, the 5th chapter, of how Jairus (Mark 5:22-43), the ruler of the synagogue, besought Jesus to come to his home and pray for his daughter. "And he cometh to the house of the ruler of the synagogue, and seeth the tumult, and them that wept and wailed greatly. And when he was come in, he saith unto them, Why make ye this ado, and weep? . .." (Verses 38-39) Here, Jesus freely entered into the home of the ruler of the synagogue, in order to heal his daughter. Notice yet another example, "And when he was entered into the house from the people, his disciples asked him concerning the parable" (Mark 7:17). Time and time again, when the crowds became too large and too unmanageable, Christ either "entered into the house," or perhaps got into a ship and LEFT the multitudes in an attempt to avoid overly large crowds. The people came to HIM, remember. He did not go to them. Some dissidents quote one scripture to prove that Jesus had no place to live. All right, let's look at Luke 9:57-58: "And it came to pass, that, as they went in the way, a certain man saith unto him, Lord, I will follow thee whithersoever thou goest. And Jesus said unto him, Foxes have holes and birds of the air have nests; but the Son of man hath not where to lay his head." Remember, I have already explained verses 51 through 56, which come just before this account. So, how do we understand Luke 9:57-58 in context? Again remember Jesus had wanted to arrange to stay in a Samaritan village on His way to Jerusalem. The citizenry wouldn't allow it. Therefore, Jesus — in the light of their denying Him overnight lodging — exclaims, "Foxes have holes and birds of the air have nests, but the Son of man hath not where to lay his head." In other words, at that particular time ("as they went in the way" [verse 57] on the way to the next village [see verse 56]), Jesus was having difficulty finding a place to stay overnight on His journey to Jerusalem. This is one reason Jesus told the young man that He had no place to stay at the moment. It was exemplary of His — at times — difficult ministry. Now does this example, also having directly to do with forsaking all physical properties, family, and facilities for the sake of the Kingdom of God, then utterly DESTROY every other plain scripture about the many, many times Jesus dwelt in a home, or visited in someone else's home, or ate a meal in a home, or was part of a large banquet party (as at Cana in Galilee), or deliberately arranged lodgings? Obviously, the Bible does not contradict the Bible (John 10:35; II Peter 1:20); and one scripture which is rather vague, or capable of two or three meanings, does not knock in the head several plain and clear scriptures which cannot be misinterpreted. In this account, Christ was telling the young man of His utter lack of dependency on material goods, properties, and possessions. While Christ did dwell in a house the major portion of His life, He placed no importance — He didn't set His heart — on those material possessions. He was ready at any instant to drop whatever He was doing in a house, and to LEAVE that house, in order to serve and to help the people. He traveled a good deal of His ministry, and was always ready at an instant's notice to leave a home, and go into a desert place, or to leave the larger city for a smaller one, or, failing to find lodgings in one town, to go on to another. On this one occasion, Christ gave those in His hearing an example of not placing their hearts on material possessions. Nevertheless, Jesus did, continually, enter into a home, which very likely was His own home, in Capernaum, as well as the home of which He spoke in the city of Nazareth, the city in which He grew up (Matt. 2:23; Mark 1:9; Luke 1:26; John 1:45). Jesus Christ was all man, just as HUMAN as YOU are human — yet He was very God. He was murdered, and was resurrected after three days and three nights in the tomb (Matt. 12:39, 40; 28:7). And most important of all, He is ALIVE, today (Heb. 1:2, 3). You'll see, if you read the account in Revelation 1:12-18. That is the picture that SHOULD come into people's minds when they think of Jesus Christ today. He is a LIVING Saviour — a LIVING Christ — a GLORIFIED, DIVINE, ALL-POWERFUL KING! You have discovered the REAL Jesus — the one in who obeyed the laws, who paid His taxes, who lived His own home, who helped the slaves of Roman officers, and who was brutally murdered in an illegal trial. You have found the Christ who looked like any Jew of His day, who was so commonplace in His appearance that He escaped out of crowds time and time again, and whose betrayer had to be paid a large sum to carefully single out which person He was. You have read about the Jesus who was subject to His parents (Luke 2:51), and who came to keep and magnify the laws of His Father, not destroy them (Isa. 42:21; Matt. 5:17, 18). You have read about the Jesus who commands His followers to KEEP THE TEN COMMANDMENTS (Matt. 19:17), who came to deliver a vital message, but not to save the world then. IF YOU HAVE READ THIS FAR, you may find yourself in the same position as the patriarch Job. Job had previously thought he had known a lot about God. But after a long series of eloquent arguments with his three friends, God, stepped into the picture and pointed out a few things Job had never considered before (Job 38, 39). Job said, "I know that thou canst do every thing, and that no thought can be witholden from thee." He continued, "Who is he that hideth counsel without knowledge? Therefore have I uttered that I understood not; things too wonderful for me, which I knew not" (Job 42:2, 3). He said, "I have heard of thee by the hearing of the ear: but now mine eye SEETH thee." He saw for the first time the true picture of that awesome Personality — the Creator God of whom he had been speaking. This had never before even reached his mind. His conscious mind had not really seen this God of whom he spoke, even though he could argue long and eloquently about "God." He said, "I have heard of you by the hearing of the ear — but now I get it, now I really see, now I understand, now my eye sees you, now I comprehend-Wherefore," he said in verse six, "I abhor myself, and repent in dust and ashes." Now he got the true perspective. He saw how great and how good was God, and how wretched and miserable and utterly blind he had been. And he made that most difficult of all human steps — he admitted he had been utterly wrong; not partly wrong, totally wrong. He said he abhorred himself. But, can you admit that you could have been utterly wrong in your former concepts of Jesus Christ of Nazareth? Can you now really repent like Job did? If you can, you are on the way to becoming a real Christian — a true follower of Jesus Christ. We have a booklet on the subject. Write for your free copy of What Is a Real Christian? And more than that, if you would like to discuss some: of these subjects with a minister of Jesus Christ, here is some GOOD NEWS. The Worldwide Church of God has consecrated and ordained ministers available in all parts of the United States and many other parts of the world, ready to counsel with you PERSONALLY — to answer questions — to help you with any spiritual problems. I think that because we say in literature, and you hear on radio and television, "There is no follow-up — no one will call on you" — many may have misunderstood. What we mean to say to the public is that there will be no follow-up trying to sell them something — we have nothing to sell. And that by GIVING us their name and address for requested literature or a subscription (free — already paid) to The PLAIN TRUTH does not mean someone will come knocking uninvited on their door. We will not send anyone to see you unless you request it. BUT, if you would like one of our trained men, graduates of AMBASSADOR COLLEGE, to call and counsel with you about any problems, answer any questions — even explain anything in the Bible, there is such a man NEAR YOU. So PLEASE feel free to invite such a visit. They and we here at Headquarters of this great Work, want only to HELP — to SERVE. We count it a PRIVILEGE to do SO. And in the meantime, don't forget to write for that free booklet — What Is a Real Christian?